President-elect Donald Trump tours the Carrier Corp. in Indianapolis following the company's announcement it would keep hundreds of manufacturing jobs in the United States rather than move them to Mexico. When Donald Trump takes to Twitter, some companies shudder. This week, Ford Motor Co. said it would scrap a $1.6 billion plant in Mexico in favor of expanding an existing one in Michigan. That happened on the same day the president-elect tweeted criticism of General Motors for manufacturing its Chevy Cruze vehicles in Mexico. GM says only a small number of the cars produced in Mexico are sold in the U.S., but that's a detail that may not register with the public. Economist Barry Bosworth of the Brookings Institution says of companies that produce consumer goods: "They can't afford bad publicity." Bosworth notes that so far Trump's targets are companies that are expanding or planning to build operations in Mexico. He has not singled out U.S. companies that built plants there long ago. "He focuses in on these individual cases," says Bosworth, "but there doesn't seem to be a rule." 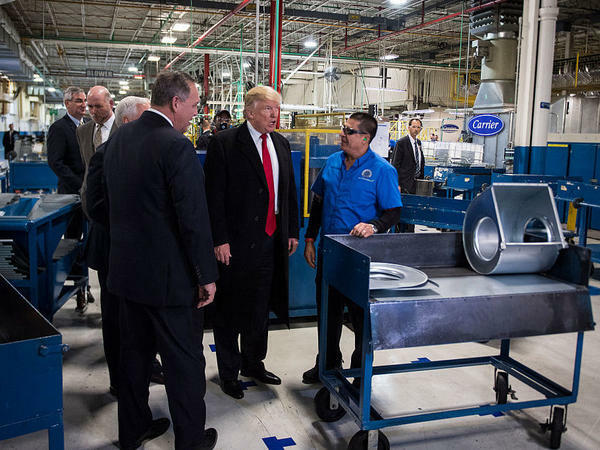 In November, under pressure from Trump, heating and cooling firm Carrier Corp., a subsidiary of United Technologies, said it would keep hundreds of jobs in Indiana instead of moving them to a plant in Mexico. Bosworth says the Trump Twitter spotlight is shining the most on big companies with well-known household brands. Automakers are especially at risk because of the sector's high volume of cross-border trade, and because it is so vulnerable to consumer opinion. Bosworth says going after a maker of obscure chemicals or a small firm that makes car components doesn't produce great headlines, nor does it move public sentiment. Trump's focus is on finished products. "If they're not assembled, they can't be identified in the terms of a specific model of a General Motors car," Bosworth says. "It doesn't have the same public appeal." Trump has talked tough on China trade as well, but Bosworth notes he has not gone after individual companies — Apple, for example, and its huge iPhone assembly operations there. China's economy is almost as big as the U.S.'s, and it has the power to inflict lots of pain on U.S. companies, like Boeing — so interfering there could backfire for American workers. Bosworth says picking on Mexico is like fighting the weak kid on the playground: It's less likely to elicit a retaliatory response. U.S. companies are the biggest foreign investors in Mexico, and U.S.-Mexico trade is worth about half a trillion dollars annually. "It's a much weaker economy," Bosworth notes, "much fewer options available to them." Economist Derek Scissors at the American Enterprise Institute says retailers, banks and other service providers aren't likely to be targeted. And, he says, he hopes the singling out of individual companies will stop once Trump takes office. "When you're president, you shouldn't be bothering one company. You should be changing policies such as corporate taxes, to change the whole landscape," Scissors argues. "Getting down into the details can't be done by Twitter." He acknowledges that tweeting about trade does accomplish a few things. First, it appeals to Trump's base. "Probably the reason that he won the election is the effort to re-shore manufacturing," he says, "not to accept it as inevitable that manufacturing will head overseas." The tweets also telegraph a message, he says, not just to the specific companies Trump has targeted, but also to firms in other industries which might be thinking about expanding elsewhere besides Mexico. "It's not going to stop at very high-profile manufacturers that consumers know about," Scissors says. "It will continue. He's just sending the signal now to everyone, 'This is your chance to make an adjustment.' "
Now, Donald Trump has said his priority as president is going to be protecting jobs, and much of his focus is expected to be U.S. trade policy. For one thing, Trump has repeatedly talked about renegotiating NAFTA, this is the free trade agreement among the U.S., Canada and Mexico. U.S. companies are the biggest foreign investors in Mexico, and the U.S.-Mexican trade is worth about half a trillion dollars each year. But lately, some of those companies are coming under fire from Trump, often in tweets. NPR's Yuki Noguchi looks at which U.S. companies might find themselves in the crosshairs. YUKI NOGUCHI, BYLINE: When Donald Trump takes to Twitter, some companies shudder. This week, Ford said it would scrap a $1.6 billion plant in Mexico in favor of expanding an existing one in Michigan. That happened on the same day Trump tweeted criticism of General Motors for manufacturing its Chevy Cruze vehicles in Mexico. GM says only a small number of the cars produced in Mexico are sold in the U.S.
BARRY BOSWORTH: Since most of these are companies that produce consumer-type goods, they can't afford bad publicity. NOGUCHI: Barry Bosworth is a senior fellow at the Brookings Institution. He notes, so far, Trump's targets are companies that are expanding or planning to build operations in Mexico. So far, he has not singled out U.S. companies that have built plants long ago. BOSWORTH: He focuses in on these individual cases, but there doesn't seem to be a rule. NOGUCHI: In November, under pressure from Trump, heating and cooling firm Carrier said it would keep hundreds of jobs in Indiana instead of moving them to a plant in Mexico. Who might be next? Bosworth says the Trump Twitter spotlight is shining the most on big companies with well-known household brands. Automakers are especially at risk because of the high volume of cross-border trade that happens in that industry, and because it's so vulnerable to consumer opinion. He says going after a maker of obscure chemicals or a small firm that makes car components doesn't make for great headlines, nor does it move public sentiment. It's about the finished products. BOSWORTH: If they're not assembled, they can't be identified in the terms of like a specific model of a General Motors car. It doesn't have the same public appeal. NOGUCHI: Trump has issued tough trade talk on China as well, but Bosworth notes Trump has not, for example, taken Apple to task for its huge iPhone assembly operations in China. China's economy is almost as big as the U.S.'s, and it has the power to inflict lots of pain on U.S. companies like Boeing, so interfering there could backfire for American workers. Bosworth says picking on Mexico is like fighting the weak kid on the playground. It's less likely to elicit a retaliatory response. BOSWORTH: It's a much weaker economy, much fewer options available to them. NOGUCHI: Derek Scissors, resident scholar at the American Enterprise Institute, says retailers, banks and other service providers aren't likely to be targeted. And, he says, he hopes the singling out of individual companies will stop once Trump takes office. DEREK SCISSORS: When you're president, you shouldn't be bothering one company. You should be changing policies such as corporate taxes to change the whole landscape. Getting down into the details can't be done by Twitter. NOGUCHI: Scissors says tweeting about trade does accomplish a few things. First, it appeals to Trump's base. SCISSORS: Probably the reason that he won the election is the effort re-shore manufacturing, not to accept it as inevitable that manufacturing will head overseas. NOGUCHI: And the tweets also telegraph a message, not just to the companies he's already mentioned, but to firms in other industries, ones that might be thinking about expanding elsewhere besides Mexico. SCISSORS: It's not going to stop at very high-profile manufacturers that consumers know about. It will continue, he's just sending the signal now to everyone, this is your chance to make an adjustment. NOGUCHI: Yuki Noguchi, NPR News, Washington. (SOUNDBITE OF THE BETA BAND SONG, "B+A") Transcript provided by NPR, Copyright NPR.